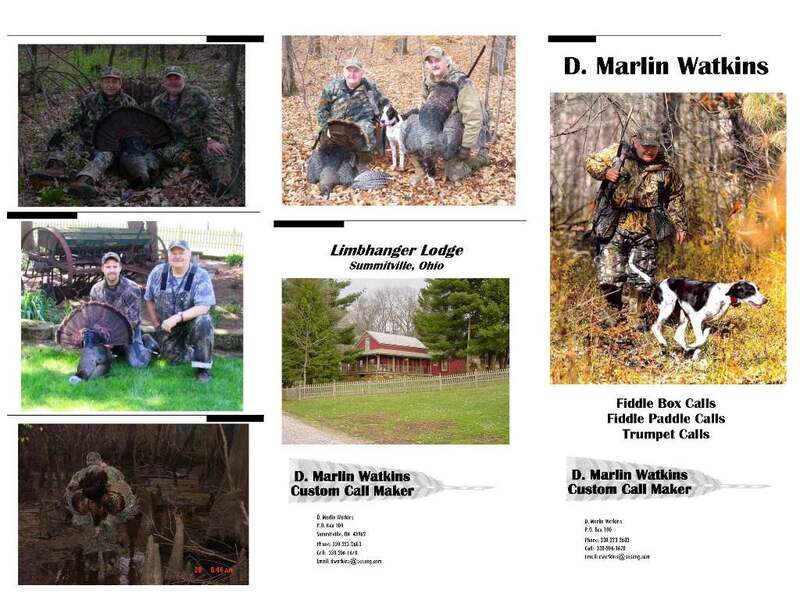 Fall turkey hunting in Ohio with Marlin Watkins and his dog Morgy in 2002. The Fall turkey season in Ohio this year was as good as I have seen. I had started scouting for birds in September, but I always have my eyes open during the summer trying to make mental notes on our turkey hatch. Up until the first of August, I was extremely nervous about the hatch because I had seen very few birds. My farmer friends were telling me differently, but you could not prove it by me. When the grasshoppers came out the first of August, everything changed. I started to see better than expected numbers of hens and poults, with a large number of those poults looking like they had been a late June or July hatch. By September, when I was taking my little shorthair to the woods to run, I was seeing good number of birds in all shapes and sizes. On the Friday before the opening of the season, I sent three of our hunters to try to roost birds while my Friend Zumer and I rode around to see if we could spot some field turkeys. At about 6:00 p.m., we spotted a good flock in an alfalfa field headed for the roost. I drove by and came back with Morgan, my shorthair. By this time, the birds were in the woods and as soon as she had a nose full of turkey, she went straight to the woods. Before long, we had turkeys sailing in at least three directions. We went in and re-scattered the birds out of the trees, and then went and had an enjoyable dinner knowing we had an opportunity for a great hunt the next morning. The next morning, I took my friend, Nick, into the woods. Within no time we had birds kee keeing below us. I was beginning to get somewhat nervous because it sounded as though several birds were starting to assemble. I was just getting ready to let Morgy re-bust the birds, when I heard a kee kee out to our right. It was not long before I called in a young hen, bringing the 2002 Fall season off to a great start. After attempting to get another friend a bird off of this same bust, we headed for my farm. It wasn’t long again before we were into birds. Unfortunately, we didn’t get the bust we had hoped for. Later in the day, we ran into a flock headed to a cornfield on my farm, and Morgy went to work. It was now 5:00 p.m., so we went in to set-up. An adult bird soon started to assemble yelp across the power line, so I took the dog and got her out of there. We fooled with birds until fly-up time and knew we should be good for the morning. On Sunday before daylight, we had set-up in the woods when we heard some birds tree calling to us. It was not long until we had a young gobbler kee keeing and gobbling to us, and not long before we harvested that bird. I told three of the guys to stay where they were, and Ron and I took off on the mule with Morgan. It was not fifteen minutes before we spotted twelve birds standing on a mowed power line. The birds went over the hill and as we walked up, Morgan hit the track and went to the woods. We did not get a good look at the bust, but I did see one bird fly and heard several birds alarm putt and cackle. We just didn’t know if it was a good break or not. Many times if these birds keep visual contact with one another, it will be the last time you hear or see them. We had plenty of time, so we went and got my friends and set-up to see what was in store. It wasn’t long before birds started to call, and then I heard Harry’s gun bark. I later found out that he had got an adult hen. After it quieted back down, I could hear a young gobbler out in front of Zumer, and he soon had the bird in his sights. We harvested one more bird from this bunch, and that was one more than I would have liked, so we headed for new territory. We were now short on tags for the day, and only had my tag left to fill. I was not that interested in ending my season on the second day, so we went prospecting that afternoon. We busted another group before leaving my farm, but I didn’t want to go after these birds. I knew from my scouting trips that I had a lot of birds that had not been introduced to a turkey dog. These were the ones I was looking for. Late in the day, we spotted forty birds across the road from some property that I had permission to hunt. I knew the property owner owned the field and some of the woods, but I did not know exactly how much. We took Morgy and got a great break on the birds, but I needed to check with the property owner regarding the property lines, who was of course, at that time, not home. That ended day two with four birds, and left fresh tags for us to fill on Monday. Monday I was eager to hunt my farm and the neighboring farms. To do this, and cover a lot of ground, I use a Kawasaki Mule with Morgy setting in-between us on the front seat. I have spent the last six years cutting and improving logging roads on my farm. I have also developed many wildlife openings for hen brooding areas that, when combined with many of the intermixed fields, allows us to see turkeys from many vantage points. We had looked over the North end of my neighbor’s and stopped to talk to an old friend of mine, “Boots”. Boots is 83 years old, and cannot get around well. To make things easier for Boots, I made a blind looking over a food plot that suits him just fine. He told me his turkey stories, and I told him mine, and we were off. Going down over the hill from Boots’ field, I saw a gobbler jump the bank. Morgy also saw the bird and the chase was on! She ran up over the bank of the logging road and ran headlong into five long beards. She started barking, and I watched five gobblers go in four directions. I’m not much for Fall gobbler hunting, but it was the best we had at the moment. I went and got Zumer and Bob, and we sat for an hour and gobbler yelped and clucked sparingly. I got antsy and told Zumer to stay there and kill Bob a long beard, while Harry and I went to look for birds. We went to the South end of my farm and caught seven birds going from the corn, back into the woods. I walked Morgy in and she hit the track, so I turned her loose. I watched as she ran down through the corn, to where we had seen the birds five minutes before. When she cleared the corn, she took a hard left away from the birds and I began to whine. As soon as she entered the woods, I could hear alarm putts, wings, and cackles, so I knew she had a good bust on birds that we didn’t even realize were in the area. At about the same time, I heard a gunshot from the North, and by the time we got back around to pick up Bob and Zumer, they had harvested a nice Fall long beard. I guess they had sat there and a gobbler clucked that deep, throaty cluck that only a mature bird can make. Zumer yelped and clucked back to him, and he instantly gobbled back. Down the hill came three mature toms running to get back with the buddies. My understanding of the shooting part of the hunt is that it didn’t go so smoothly. But, that’s whey they let you have three shells. We then drug Bob and Zumer with Harry and I, so I had an audience for my turkey hunt. By this time, my birds had been busted for at least thirty minutes. On the first call, I had a young bird respond. We played with this birds mind for about 10 minutes, when a young gobbler came back to me, made three calls, and ran in. With a three man and one dog audience, my shooting skills also suffered. On the second shot, I was yelling at Bob to turn the dog loose. It wasn’t much of a chase, so we sat there as little Morgy came dragging a young gobbler back up the hill. We were out of tags again, but we had two coming in the morning. That evening, while scouting for birds, we ran into my neighbor and he said he had just seen two flocks of turkeys on his farm. I told him it had been nice talking to him, but we had to go! We took off on the mule so see if these birds were still on the ground. As we approached the area, I spotted two birds silhouetted against the skyline on top of a far hill. I went up the hill with Morgy and as soon as she crested the hill and got into the woods, she was into birds. We watched as birds sailed across the dirt road from one hill to the other. More birds went to the left, to another hilltop, and even more sailed out in front. We were set for tomorrow! Then, as we left the house to go to dinner, at the top of the little road that leads to my farm, I could see five birds standing on the road getting ready to jump into some big oaks for the night. Well, you never pass up an opportunity, so I jumped out and charged them! I got a pretty good bust. We now had three tags to fill, and had two groups busted, and knew where the third group was roosted. That makes for a good nights sleep. In the morning, I sent Bill to the big group on the hilltop. I took Ron and went down in the valley where I had busted the five, and I sent Zumer to the roosted birds. Ron and I approached the valley, and tried to find a decent place to set up. There was not much to pick from, but we set down and I did a little tree yelping, and a few clucks. These five birds looked to me as all adult hens, so I didn’t get carried away with the calling. Before fly down, we heard a hen call to us, and then heard her come out of the tree. That bird was within 30 yards of us twice, but no matter what we did, we could not see the bird. As this was going on, I heard a distant gun shot and knew that Bill had scored. Starting to get antsy, as I always do, I started aggressively yelping on my cypress paddle call. A gobbler came back to me yelping and clucking. I switched to gobbler yelps on the paddle call, and he gobbled about 200 yards out. Just then, I heard a truck pull up on the dirt road above us, and I knew that Bill or someone was coming to tell us to get over there. Since Ron had helped me the first two days to get everyone else a turkey, I figured we better go and get him a bird, instead of setting all morning fooling with this gobbler. When we crested the hill, Bill told me that he had scored at the big break, and that Zumer had busted the oak roost. When we drove over, Zumer told me he had a really good bust on top of the opposite hill from where Bill’s birds were. I asked him if, with the Mule, it would be possible to get Boots in there and get him a bird. He assured me that we could. Zumer, Ron, Bill, Morgy, and I all went to the break site while Harry went to get the Mule and fetch Bootsy. While we climbed the hill, and as we approached the break point, we could already hear birds calling. Zumer is always looking at his watch, so he let me know that the hunt lasted all of six minutes. We went in, set up, and had birds responding on the first call. Before long, a group of three young gobblers came up the hill, and Ron shot his bird. Within about fifteen minutes, I heard the mule coming, and we assisted in getting Boots into the woods, and set up. I set him where we had a little greenery in front of us. I knew that would afford us a little more opportunity to move around when the birds came in. Again, on the first call, a bird responded. Then a young gobbler came up over the hill and Bootsy’s hunt was over! I do not think you could have found a happier group of turkey hunters. Our perpetual turkey tag problem arose again. It was 10:00 a.m. on the fourth day of the season, we were out of tags. Not to worry, I found an eager hunter. That afternoon, I took one of our young engineers from work. We hit the woods, and Morgy picked up a track at the edge of a cornfield. As she followed the scent, I saw a hen step out 80 yards beyond her. When she hit these turkeys, I watched as no less than twenty-five birds boiled out of the corn and scattered in all directions. It was a late afternoon break, which is far from my favorite. But, it worked for us, and Jason had his turkey. That made ten birds in four days, and Morgy and I were both ready to cool our heels for a couple of days. Something isn’t quite right about this picture, because for me, that meant going back to work. For her, that meant lying on the couch. Someday, I’ll figure that one out. Fall turkey hunting with a good dog is very effective. In the state of Virginia, it is a 100 year sport. Any dog will work, as long as he has a heart to hunt, can smell, follow, and chase turkeys, bark if he will, and then set quietly in the blind while birds are calling back to you. That is a lot to ask from a hunting dog, but it is not an impossible task. Real turkey dogs are the ones bred by John and J.T. Byrne from Virginia. These dogs are ¾ bird dog, and ¼ plot hound. Mr. Byrne has been working on this bloodline for forty years, and has developed a tremendous breed of dogs. If God grants me enough time, J.T. has promised me a dog, and I’ll take him up on that promise. In the meantime, little Morgy can go from turkeys, to pheasants, and she loves both! We ended the season with fourteen birds harvested, three missed, and a few not shot. The only one that bothers me is a tremendous long beard that stood for a full ten minutes, forty yards away from me, and I couldn’t get my friend to see this bird, no matter what I said. We are going to continue with bows in November, and actually try and video a turkey bust with Morgan. Since the chase is way more important to me than the kill, this suits me just fine. Fall turkey hunting is new to Ohio. It offers true turkey men and women an extension to their time in the turkey woods that otherwise would not be afforded. Turkeys can be busted with human legs and brains very effectively. I just love my hunting dogs! The other value of Fall hunting is the insight it gives you into turkey nature and habit. After seeing how effective that gobbler yelping and clucking was on these Fall gobblers, you can bet I will use it next Spring, when that long beard stands off at 100 yards, very emotionally attached to his hens. 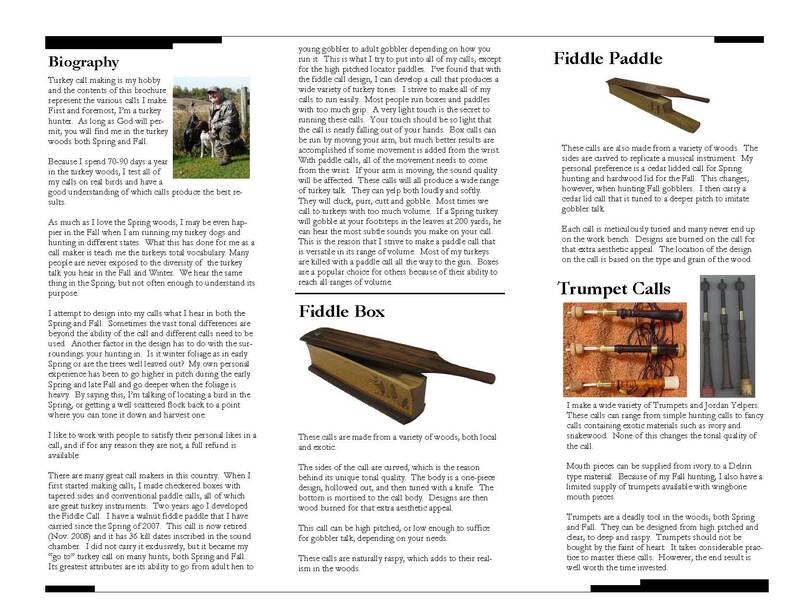 Look at Marlin's turkey call hunting brochure below, or view the complete pdf (Right Click - Save As, then Open).